This has to be one of my favourite middle grade reads so far this year; pure fantastical fantasy. I'm really pleased to have been able to ask a few wee questions about the book and Ross's writing career. Thank you for your brilliant responses. Tell us a little bit about The Nowhere Emporium? 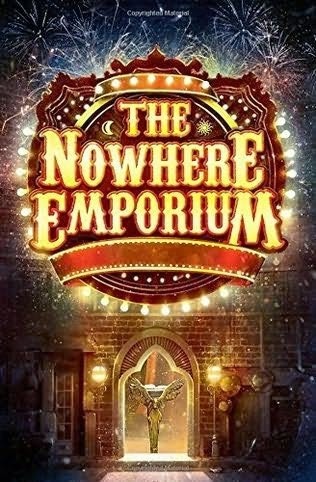 The book follows Daniel Holmes, an orphan who stumbles across an enchanted shop called The Nowhere Emporium. Daniel sort of falls into a job as apprentice to the mysterious owner of the Emporium, Lucien Silver. The shop contains a huge labyrinth of passageways, and behind the many doors lie Mr Silver's "Wonders" - rooms where nothing is impossible and the only limit is the imagination. Daniel loves his new life in the shop, but when a shadow from Mr Silver's past shows up and threatens everything, it falls to Daniel to save the day. Daniel is an orphan. He has vague memories of his parents, and when we meet him at the beginning of the book his life is pretty miserable. He's lonely. He's having a bit of bother with bullies. But that changes when he finds the Nowhere Emporium. It becomes quite obvious that Daniel has a gift for magic. But I think it's Daniel's bravery and cleverness that really sets him apart, even over and above the magic stuff. Will you be writing a sequel? If so what can you tell us about it? I wouldn't rule it out but I really don't know! The kernel of an idea for an Emporium sequel is definitely there, but there are so many other ideas pushing and shoving in my head, and I'm always attracted to shiny new things. And of course it also depends on whether readers actually want a sequel. The short answer is no. The slightly longer answer is that I do make notes of where I think the story will go. It's a bit like setting of on a journey with a few places marked on a map, but lots of space between those destinations for exploring. Sometimes there's treasure waiting on those unexpected detours. I do get lost in a story when I write, and for me that's one of the joys of being a writer. The characters come alive and do unexpected things, and I suppose there must be a bit of me in all of them. My lovely agent Stephanie is the first person to read any of my new stuff, and she's really good at telling me right away if something is working or not. We worked hard to get The Nowhere Emporium in shape, and it's a better book because of that process. And of course, once the book finds a publisher, all the fun starts again when you get to work with an editor, refining the story even more. How do you think you have evolved creatively? I'm definitely more confident now, and I'm becoming comfortable in trusting my gut on what works and what doesn't. Also, I think The Nowhere Emporium is a big leap forward for me in terms of finding my voice and the sort of stories I want to tell. I'm just getting started. Loads of times! If I wrote longhand I'd have wasted an unthinkable amount of paper on rotten ideas by now. Thankfully I write on computer so the trees are spared. Neil Gaiman for sure. Everything he writes sticks with me afterwards for the longest time. The Ocean at the End of the Lane is one of my all-time favourite books. I'd also say JK Rowling, Terry Pratchett and Stephen King have been major influences.